My favourite meal of the day is breakfast. And while I do love me some eggs and bacon, or a tall stack of buttermilk pancakes, I much prefer to actually make those things for dinner. What I like in the morning is a nice bowl of cereal. I don’t know what it is about cereal, but it makes me feel like I am starting my day off right. In fact, I can be known to be grumpy if I feel like I am not starting my day off right. When I was pregnant with the Little Bird, I did that lovely sugar test. You know the one, you sat at the lab for hours, drank some Fanta-like orange drink and they stabbed you took blood from you a minimum of four times to test your glucose levels to determine if you had gestational diabetes. When my results came in, I was on the “cusp”. What they meant was that this girl was instructed to follow the strict diet and test my blood levels multiple times a day. Ultimately it meant that the last three months of my pregnancy were m.i.s.e.r.a.b.l.e.! Why? Mostly it was because I wasn’t allowed to have cereal and milk for breakfast. I had to start my day with protein. I didn’t want protein, no matter the option or the form. I cried every morning as I forced myself to eat an egg white omelet. Honestly, tears flowed down my cheeks as I chewed my food, psyching myself into eating it. I hated every minute of it. For the record, when I say I like to have cereal for breakfast, I don’t mean Fruit Loops or Corn Pops. I like what my brother used to refer to as “horse food”. 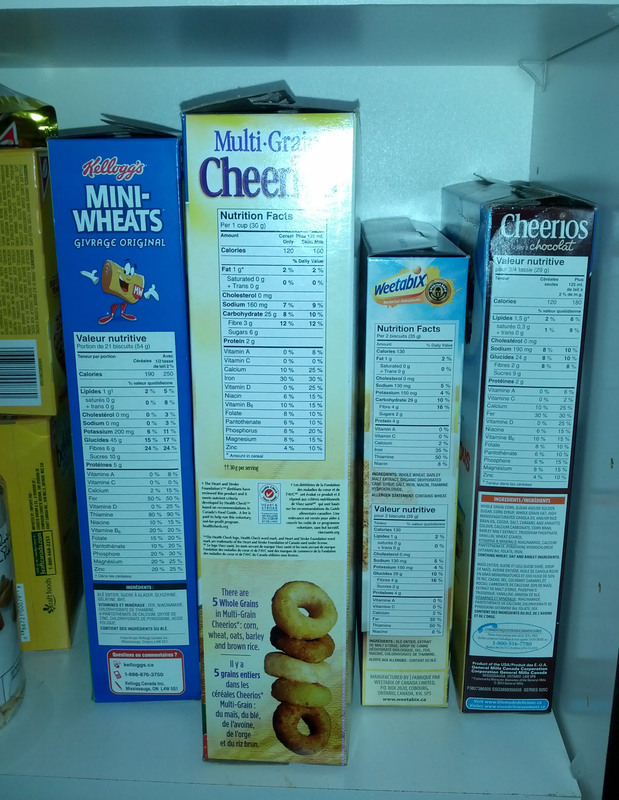 In my pantry you will <mostly> find healthily cereals; Weetabix, Muesli, Kashi, Bran Flakes, etc. There are some other ones in there, and those are the kids. But I am happy that they enjoy the likes of Shreddies and Mini-Wheats too. What’s in my pantry right now. Seriously, I really like those cereals. I always have. This is why my brother thought I was insane. As a young girl, I didn’t fight him for the Honeycomb or the like. I would have them once in a while, but mostly they were all his and the whole grain, fibre-filled choices were mine. My Nonna Angela used to give me Weetabix. She was my maternal grandmother, who was an amazing woman and a bit of a naturopath before her time. She introduced me to that yellow box and the biscuits that soak up milk like a sponge. She used to sprinkle a little sugar over the top to sweeten the bowl a bit, and it’s something I still do today. I know, it defeats the point of the healthy but now I use Splenda and it is more of a light dust, versus a solid sprinkle. Either way, I enjoy it. It makes me happy and it really is how I like to start my day. Of course, a tall cup of coffee follows right after. And that is a must, or this really will be one grumpy girl! How about you, what is your morning happy? 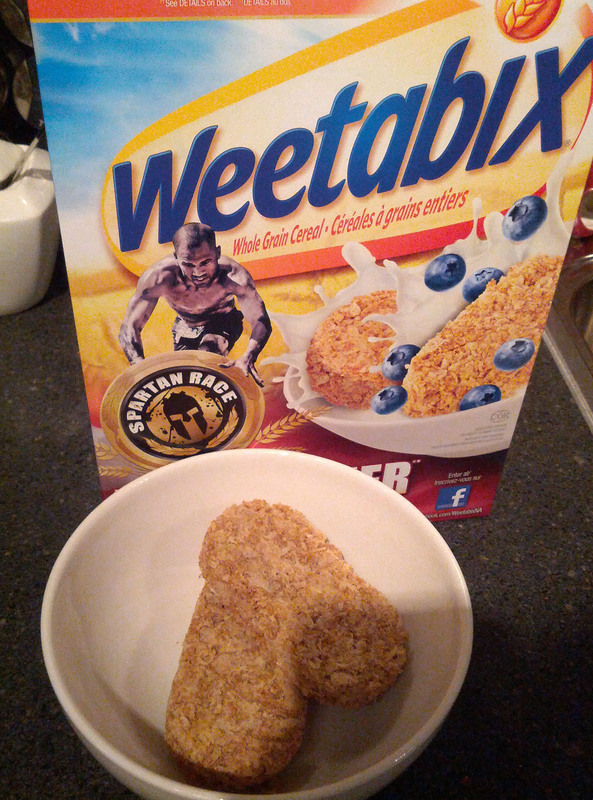 Footnote: I was not compensated by Weetabix. These opinions are all my own!